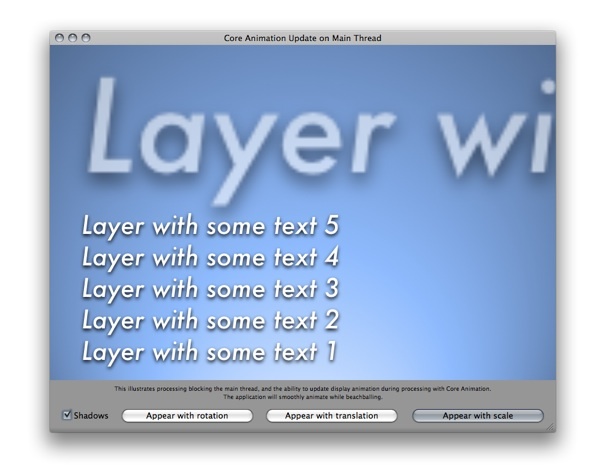 Another Core Animation sample, serving as sample code for Threaded Core Animation. This will be a bit clearer than just text and shows how Core Animation can update itself even when you're busy on the main thread, using [CATransaction commit]. The transitions happen thanks to [CATransaction setValue:[NSNumber numberWithFloat:0.0] forKey:kCATransactionAnimationDuration] which changes the default speed of interpolation to a new value. When you set a new value of a layer attribute, CA will interpolate from its current value to the new one with a set delay. If you want to make a transition, you can't go around setting your start value and then your end value : CA will start interpolating from current to start, but then you'll be setting a new value, the end one, right when CA has just started interpolating ! kCATransactionAnimationDuration lets us get rid of that delay while setting our start value, CA can then interpolate from our transition start value to the end value. Hey there, your blog is awesome. I love the CoreAnimation postings especially. However, for some reason NNW keeps thinking your site is constantly updating the old blog posts and they keep appearing in my feed. I'm wondering if the problem is your end and if you'd take to look at fixing it? That's because they are updated :) I use a template at the bottom of the Core Animation posts, when I add a new post I'll update the template with it and the old posts will get the new version of the template as well. I didn't realize this would mark the old posts as new. I'll look into it.